Richard Eskow of The Sentinel Effect is hosting this week’s edition of Health Wonk Review and he’s seeing double. It’s a 24-issue post, so dig in for some good reading. Health Wonk Review is truly becoming a force in the health care policy arena – I’d be surprised if there were any other nook or cranny on the web with a savvier grouping of health care folks who represent all aspects of the industry. As if the link between obesity and adverse health effects weren’t substantial enough, three new studies add to the growing body of evidence that employers pay a steep cost for overweight employees. Joanne Wojcik of Business Insurance reports on two studies linking obesity to increased employer costs for health care and workers compensation. One, conducted by the Medstat Group Inc. showed that moderate and severe obesity were linked to annual health care cost increases of 21% and 75%, respectively. Moderate obesity was associated with a $670 increase in costs, and severe obesity resulted in a $2,441 increase in costs. In a third study, CCH reports that researchers at the Johns Hopkins Bloomberg School of Public Health Center for Injury Research and Policy recently published a study in the American Journal of Epidemiology showing that obesity increases the risk of traumatic workplace injury. Rsearchers studied medical and injury data on employees in eight separate locations of a large aluminum manufacturer. “Employees were grouped into five categories: underweight, normal, overweight, obesity levels I and II and obesity level III. Of the 7,690 workers included in the study, 29 percent were injured at least once between January 2, 2002, and December 31, 2004. Approximately 85 percent of the injured workers were classified as overweight or obese. More than 28 percent of injuries occurred among employees classified as overweight, 30 percent in the obese I and II category and almost 34 percent in the obese III category. The number of Americans considered obese by the CDC in 2001 was 44 million – or approximately one in five. This is a 74 percent increase since 1991. Obesity is growing at two or three times GDP! The percentage of U.S. adults classified as obese doubled between 1980 and 2000, from 15% to 31%. (1999 National Health and Nutrition Examination Survey, CDC National Center for Health Statistics). On average one out of every three people you know and work with could be considered obese. According to the Centers for Disease Control. obesity has roughly the same association with chronic health conditions as 20 years of aging. The Surgeon General reports that more than 9 percent of the nation’s health care expenditures are directly related to obesity and physical inactivity. They calculate that to cost out at about $117 billion annually and relate to 300,000 deaths per year. UnumProvident, a provider of disability income protection insurance, reports a tenfold increase over the past decade in short-term disability claims attributed to obesity, based on research using their disability database. Making on-site wight loss programs available at work. Working with group health vendors to develop programs targeting obese populations. Implementing a healthy eating campaign, including healthy options in cafeterias and vending machines. Seeking employee educations materials and disease management programs from health care vendors. Providing EAPs for private counseling or community-based weight management programs. Offering incentives, such as a discount on health care premiums. Ashes to Ashes, Dust to Compensability? Felicia Dunn-Jones was a civil rights lawyer who worked one block away from the World Trade Center. She fled the office on 9/11, inhaling dust from the falling towers. She was covered with ash laced with asbestos and other hazardous material as she ran for safety. Now, nearly six years later, over five years after her death, New York City Medical Examiner Dr. Charles Hirsch has determined that Dunn-Jones’s death was related to the 9/11 attack. In the days and months following the attact, Dunn-Jones developed a serious cough and had trouble breathing. She died five months later. Dr. Hirsch has amended Dunn-Jones’s death certificate to indicate that exposure to trade center dust “was contributory to her death.” The manner of death thus changes from natural causes to homicide. The medical examiner still has some doubts as to whether the trade center dust caused the sarcoidosis that killed Ms. Dunn-Jones. He suspects it was a pre-existing condition, nonetheless clearly and significantly aggravated by the exposure on 9/11. The issue for Dunn-Jones’s family is not one of payment. They have already received $2.6 million from the Victim Compensation Fund. But it does raise an interesting question relative to workers compensation: was Dunn-Jones’s illness work-related? In the moments following the attack, Dunn-Jones fled her office. Technically, once she reached the streets, she was no longer at work…She was commuting, heading away from work. She eventually made her way home to Staten Island. An administrative law judge could reasonably conclude that this is not a work-related illness. Dunn-Jones happened to be at work, which happened to be near the World Trade Center, which happened to be attacked. Once she fled the building, she was a commuter (a commuter suffering from terror, but a commuter nonetheless). On the other hand, an equally reasonable judge might lean toward compensability, based upon the fact that Dunn-Jones was at work when the attack took place – and it was physically impossible for her to remain there. She was not engaged in an ordinary commute, but a horrific flight from immanent danger. Perhaps these are morbid distinctions that most of us would prefer to ignore. But the center attack is certainly not the last incident of its kind. Millions of employers are paying for workers comp policies, under the assumption that employees are covered for work-related injury and illness. If and when the next attack comes, the issue of compensability will quickly become paramount. It is no exaggeration to state that the future of the insurance industry as a whole might be at stake. We are making a few guest posts at Working Immigrants while Peter Rousmaniere is traveling. Today’s post – Edgar Velázquez: Maimed at work, then deported – involves workers compensation (and the lack of it) in the case of an undocumented worker who was severely injured by a chainsaw while working for a Rhode Island company, Billy G’s Tree Care. To add insult to injury, literally, when Velázquez showed up at court for his workers compensation hearing, he was met by immigration officers who arrested him and sped him back to Mexico. His employer denies having made the call to immigration authorities. In fact, his employer denies any knowledge of Velázquez entirely. This is just the broad brush outline – it’s a disturbing case and the reporting from The Providence Journal is worth reading. Cavalcade of Risk #26 is freshly posted. Kudos to Jay Norris of Colorado Health Insurance Insider for a substantive issue. The excellent blog that Jay and his wife Louise maintain is the expert source for Colorado health care matters. If I’m not mistaken, issue #26 marks the one year anniversary for Cavalcade – kudos to founder and chief cheerleader, Hank Stern of InsureBlog. We’ll be hosting an upcoming issue here in June. NCCI has recently released its its annual State of the Line workers compensation market analysis which is really what all the numbers geeks in our industry wait for with some anticipation. You can read the summary in the press release – NCCI Reiterates “Optimistic but Cautious” Outlook for Workers Compensation Insurance Market – or read the full report (PDF). There’s also a PDF of the PowerPoint and a video version of the presentation if you you’re a true insurance nerd. Here’s the long and the short of things: the market looks good, better than it has in a number of years. Thirty years, to be exact. At 96.5%, the combined ratio, which is one of the industry’s primary barometers for assessing market health, is the lowest that it has been in three decades and incredible drop since its 2001 peak of 122%. The combined ratio reflects an insurer’s loss experience plus expenses. In non-jargony terms, the combined ratio essentially reflects how much an insurer pays out for each dollar it takes in. In most business scenarios, the cost of goods or services would tally under 100% with the remainder being the profit margin. Insurance presents an unusual scenario because investment income allows carriers to realize a profit up to about the 110% range, or even higher. So anything under 100 is quite good. There are other positives, too. The frequency of injuries continues to drop, reserves have been strengthened significantly, and the residual market (or “markets of last resort”) continue to shrink. But put away the champagne, confetti. and noise makers because there are a few mitigating factors. One is that California’s improved scenario is responsible for about 10 percentage points in those results, so if you take that away, things aren’t quite so rosy. Throw in pallid investment returns, and while still a good year, you essentially have what the actuaries have termed “cautious optimism.” Whee. Medical costs continue to escalate. The medical portion of the claims dollar is now topping 59%. Fifteen years ago when I got in this business, it was about 48%, with more than half going to wage replacement. That’s a seismic shift, and it doesn’t look like there are any brakes on escalating medical costs in the future. The market may have crested. Workers comp premiums are decreasing and in competitive or buyer’s markets, insurers have historically been their own worst enemies by being too aggressive in discounting price to gain market share. So far so good, but we may be at a point where the rubber meets the road. Joe Paduda has more on the dynamics of pricing and hard and soft markets. The Terrorism Risk Insurance Extension Act – the federal backstop – is scheduled to expire at the end of the year and it’s uncertain if it will be renewed. While some other lines of insurance can exclude coverage or price to include the risk, the regulatory nature of workers comp precludes this, leaving insurers rather exposed. Bad things in other lines could have a spillover impact. Again, I turn to my colleague Joe Paduda for his view of scary things that could affect the property casualty industry performance as a whole. The work force is getting older and fatter. And it isn’t just the older people who are getting fatter, diabetes is reaching what some health care observers have characterized as epidemic. Both these factors – age and weight – increase the risk for new injuries and could add to the severity (read: medical costs) of any injuries that occur. The Comp Success Story in Massachusetts: Who Pays? Massachusetts recently announced yet another reduction in workers comp rates, this time a double digit 16.9 percent. Since 1990, when the state implemented wide-reaching reforms, the rates have come down well over 60 percent. Employers are paying about the same rates that were in effect in the early 1980s. It’s the greatest comp success story among the industrial states. Indeed, with this pending reduction, the cost of workers comp in MA is likely to be among the bottom five states across the entire country. This impressive performance is even more remarkable when you consider that the state offers some of the highest benefits available to injured workers. It seems paradoxical: very low costs for businesses, very high benefits for injured employees. So the question becomes: who pays? Who bears the burden of the “Massachusetts miracle”? Injured employees: while MA offers one of the highest indemnity wages in the country, it also has a relatively low rate of reimbursement: injured workers collect just 60 percent of their average weekly wages, tax free. Most states offer at least 66 2/3 and some over 70 percent. You will hear complaints from organized labor in MA that the rate is unacceptably low. To qualify for the maximum indemnity, a worker would have to make over $1,600 a week. With the exception of the skilled trades, most people on workers comp collect nowhere near the maximum amount. Medical providers: In most states, medical costs in the comp system are soaring, reaching 60 percent of total costs and more. In MA, by contrast, medical costs are still only about 35 percent. Why? The state may be blessed with as good a medical infrastructure as you can find anywhere in the world, but the providers in this system are squeezed to the max by very low rates of reimbursement in the comp system. The rate schedule runs about 20 percent below Medicare. By any standard, that is just unacceptable. Insurance carriers: a number of insurers have fled the state, complaining that the rates are just too low. (If the rates were inadequate last year, how will they look after an additional 16.9 percent reduction is tacked on?) The state’s remaining carriers are understandably nervous. With the state’s aging workforce, the shadow of terrorism and workers comp the potential retirement system of choice for those with no choices, carriers are sweating at the prospect of another rate reduction. As carriers hone their underwriting criteria, we are likely to see a growth in the assigned risk pool (currently running about 15 percent of the market). Add to this mix the fact that data from the state’s largest comp carrier, AIG, was not factored into the rate setting, and you have a potential witches brew for a troubled future. Attorneys: Prior to the reforms, Massachusetts routinely cut settlement checks for injured workers who could not (or would not) return to their jobs. There were about 20,000 such settlements a year. Now we are seeing about 8,000 settlements a year. Settlements are the bread and butter of attorneys, who rarely counsel their clients to go back to work. It’s safe to say that attorneys, along with medical providers, are bearing the brunt of the Massachusetts reforms. Injured employees: it’s great to set a high ceiling for indemnity and encourage return to work, but the reduced rate for indemnity is unfair and a burden for disabled workers. Medical providers: Pay a fair rate for services rendered, lest other payers be made to subsidize the real costs of treatment. The rate schedule needs to be revisited. Insurance companies: as long as carriers continue to offer significant premium discounts (and they do), they undercut their argument that rates are too low. When the premium discounts disappear, the rates will stabilize – and might even go up. Attorneys: I respect the role of attorneys in the comp system – and I’m confident in their collective abilities to find opportunities in the ever-evolving system. Finally, let’s not forget the unprecedented employer education project that anchored the reforms in Massachusetts. The Qualified Loss Management Program (QLMP) offered signficant premium discounts to employers in the assigned risk pool who agreed to learn how to manage the costs of workers compensation. With over 60 percent of the state’s employers in the pool during the early 1990s, the QLMP program transformed the way employers viewed workers comp. They began to perceive comp as a manageable aspect of business. They understood the relationship between their losses and their future costs. They learned that loss prevention was worth every reasonable effort. And they also recognized that by using temporary modified duty to speed recovery, they were helping their workers and helping themselves by lowering the future cost of insurance. This unprecedented education project is the heart and soul of the state’s comp success story. Any state wishing to duplicate the wildly successful reforms in Massachusetts should keep the QLMP employer education component firmly in mind. 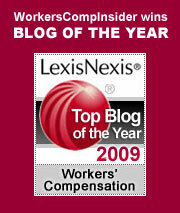 Employers are key players in the workers comp system. If you really want to improve your results, employers must be the centerpiece of your effort. The recent passing of Jerry Falwell reminds us that family values are definitely in the eye of the beholder. One’s man’s family values are quickly transformed into fear and loathing for others with different values. For too many people, it’s not enough to develop and embrace your own values: you have to convince others to join you – or persecute/diminish/destroy them in the process. We are social creatures, but the socialization process itself is not always a pretty sight. Which leads us to the ever-divisive issue of immigration reform. As one who has been critical of Congress for its inability to do anything about the immigration mess, I am happy to see some progress. We finally have on the table proposed legislation that would legitimize (to some degree) 12 millon or so undocumented immigrants and set up a structure for admitting an additional 400,000 per year. But with the print on the 300+ page bill barely dry, the attacks have already begun. “This is amnesty for criminals!” cries the right. “Unfair to families and labor!” cries the left. The bill attempts to be pragmatic. No ideologue will embrace it. You could argue that in trying to stake out the shaky middle ground, the bill makes everyone unhappy. Indeed, this is such a volatile issue, there may not be a viable middle ground. Whatever the final shape of the legislation – assuming something is ultimately passed and signed into law – there are going to be unintended consequences of substantial magnitude. The left fears that the bill will reduce wages. But wages are already suppressed by this huge, undocumented workforce. Once these people are credentialed, their wages and benefits are going to go up. Undocumented workers live in constant fear of discovery. They are willing to work for less, forego benefits to which they are entitled, and generally live beneath society’s radar, in order to avoid arrest and deportation. Once they have the new “Z” visas, their working conditions should improve. And as this change takes root, we will all feel the result in the form of higher prices. As for outrage on the right – that we are rewarding criminal behavior – the intent of the bill is to decriminalize an essential component of the workforce. It would be logistically impossible and economically disastrous to deport 12 million people. They are performing vital jobs, often in abominable working conditions. They are here because we need them. Thus it is no great concession for Congress to legitimize these people: realistically, we have little choice. We have already commented on another goal of the bill, to stop the influx of illegal immigrants through enhanced border vigilance. I personally am looking forward to the construction of America’s Great Wall. It will cost billions. It will prove remarkably ineffective. And the only people willing to build it will be the people it is meant to keep out. Under the family values of American labor, the working conditions in the deserts of Arizona, New Mexico and Texas are unacceptable. Only the truly desperate would accept these jobs…and we all know who they are. So we’d best build the wall before we hand out the new Z visas. Once immigrant workers have their visas, they won’t want the jobs either. A new issue of Health Wonk Review is posted at Health Care and Marketplace Review and is awaiting your perusal. The host blog’s author, Robert Laszewski, is a welcome addition to the health blogosphere. Our friend Joe Paduda calls him “one of the most intelligent, insightful, and articulate observers and critics of the US health care system” and since Joe is no slouch himself, we are inclined to believe him. When you are done sampling the wonk world, be sure to stop back and poke around the nooks and crannies of Robert’s blog. As usual, Health Wonk Review has a variety of interesting posts from the health care policy crowd. Among the roster of posts, I was surprised to see one from Pioneering Ideas, a blog from the Robert Wood Johnson Foundation. It seems they have had an active blog since about last October. Another welcome addition to the blogosphere. And speaking of new blogs, we are also happy to see the debut of Dr. J’s Jottings from Dr. Jennifer Christian, a friend and respected colleague of Lynch Ryan. We’ve talked about her work before, most recently in citing her leadership role in the American College of Occupational and Environmental Medicine’s important new guideline on the topic of Stay at Work / Return to Work. She’s not a stranger to the online world by any means – she hosts the lively and active Work Fitness and Disability Roundtable. We’re delighted to see all these smart people adding their voices to the collective discussions in the blog world. Unhealthy worker lifestyles and an aging work force may portend trouble on the horizon for the nation’s employers. A recent article in The Wall Street Journal points to the disturbing trend of long-term worker disabilities that are accelerating at a rapid pace. This comes at a time when employers may be facing labor shortages with the impending retirement of the large boomer population. More than 500,000 individuals received long-term disability insurance payments from CDA member companies in 2006 – 4.4% more than 2005. CDA member companies paid in excess of $7.2 billion in long-term disability insurance claims in 2006, a 7.5% increase over benefits paid in 2005. 33% of individuals receiving long-term disability insurance benefits did not qualify for Social Security Disability Insurance, and 95% of reported disabilities were not work-related. 6.8 million disabled workers received payments through SSDI in 2006, 4.4% more than in 2005 and 51% more than the 4.5 million disabled workers receiving payments in 1997. The rate of disability for women workers is growing faster than that of their male counterparts. Since 1997 the number of women covered under SSDI has grown from 16% to 47% of covered workers compared to a 9.9% growth rate for men, while the rate of disability for women workers has grown more than 60% compared to 32% for male. For the last two decades, there have been numerous attempts to cobble the various disability programs together and serve them under one roof: 24-hour coverage, disability management, and absence management, to name a few. Often, for all but the largest self-insured employers, these attempts have been less than successful due to complex state-by-state regulatory environments, in-house management silos that administer programs differently (risk management vs human resources), and differences in program incentives, disincentives, and benefit structures. One area where workers comp has made huge progress and serves as a model for non-work related disability programs is in the area of return-to-work programs. For many, migrating RTW to disability has been slow going – often because it is a voluntary employee financed benefit, so the urgency hasn’t always been there. But with the converging forces of aging workers, a less healthy population (increased obesity, diabetes), and a tight labor pool, the sense of urgency may be growing. “American Express says it has altered the company cafeteria at its Greensboro, N.C., call center to accommodate wheelchair-bound workers, enabling them to access microwaves and bus their trays on carts. Company employees who rely on public transportation because of medical reasons, such as paratransit transportation, can get flexible work schedules to accommodate their needs. These types of creative programs are always easier for the big guys to effect than the smaller employers, given the law of large numbers, but the large employers can also serve as laboratories for what works well and what doesn’t. And the climate may be right for moving the needle a little further in terms of a unified approach to disability management and stay at work/return to work programs.